Dirk Willemsz (also spelled as 'Willems') was born in Asperen, in the Dutch province of Gelderland, and was rebaptized as a young man. His devotion to Anabaptism and the rebaptism of several other people in his home, led to Dirk's capture and imprisonment. One day he managed to escape from prison. Pursued by a guard, he succeeded in crossing a river covered with thin ice. The guard following him was less fortunate: he fell through the ice and was on the verge of drowning. Dirk went back and saved the man. The guard was grateful and would have let him go, but the mayor ordered him to recapture Dirk. He was burned at the stake outside Asperen on May 16, 1569. Dirk has become one of the most celebrated martyrs. 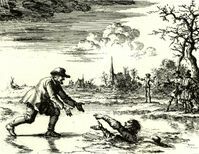 Jan Luyken's engraving of the rescuing scene (above) is probably the single most powerful image of Anabaptist martyrdom. Recently the town of Asperen has named a street in Dirk's honor: the Dirk Willemszstraat.